Missouri’s soybean farmers broke ground on a new building in western Jefferson City today, kicking off a roughly 18-month project to develop the Center for Soy Innovation. Soybean growers at the event highlighted the need to be a resource for farmers and the community as a driving force behind the project. 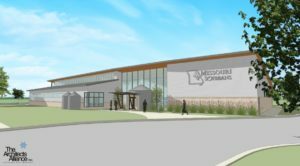 The Center for Soybean Innovation will bring together the many organizations working with and on behalf of Missouri’s soybean growers in one location, and serve as a hub for business development and incubation, as well as value-added agriculture. From the Missouri Soybean Association and Merchandising Council to the Biodiesel Coalition of Missouri and Foundation for Soy Innovation to the administrative functions for farmer-owned biodiesel plants, Missouri Farmers Care and the Ag Education on the Move programs, it will be a one-stop-shop. The building will also feature soy-based building materials and demonstrate new uses for soybean, from soy-based countertops, flooring and insulation to turf, asphalt sealant and biodiesel/BioHeat. The Missouri Soybean Merchandising Council is a statewide, farmer-led organization working to improve opportunities for Missouri soybean farmers though a combination of research, outreach, education and market development efforts supported by the soy checkoff.